End-Point Assessment is one of the biggest changes in the apprenticeship reform. The purpose of it, is to make sure that apprentices are competent within their job role before they qualify. 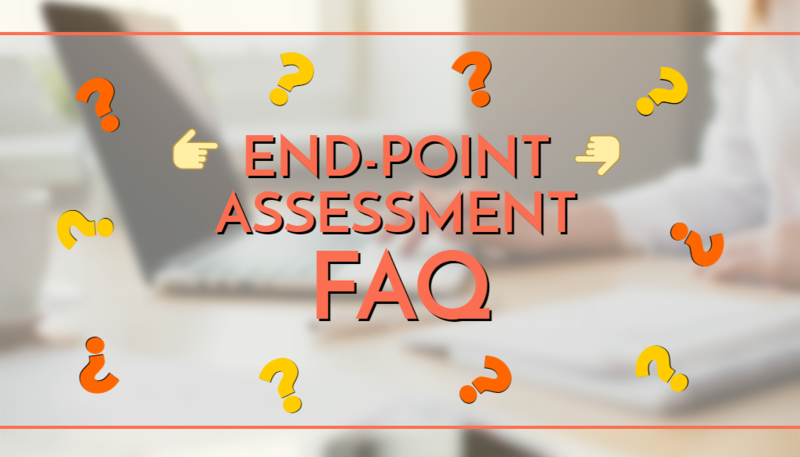 We get asked many questions about the End-Point Assessment, so we thought it would be best to put all the FAQ’s together in one blog! What is an End-Point Assessment? End-Point Assessment (EPA) is a one-off assessment that apprentices undertake right at the end of their apprenticeship. For an apprentice to officially complete their apprenticeship, they are required to complete the EPA. How Does End-Point Assessment Work? When an apprentice comes to the end of their ‘on-programme’ part of their apprenticeship (the part where they receive vocational training from the training provider), then the employer will decide whether they think the apprentice is ready for the EPA or not. This stage is known as the ‘gateway’. The EPA doesn’t have to cover every part of the standard. Instead, the purpose of the End-Point Assessment is to provide a holistic evaluation on the Knowledge Skills and Behaviours (KSBs) that the apprentice should have learned. These KSBs will be listed in the respective apprenticeship standards. It’s the job of the End Point Assessor to give the apprentice a score for each of these three areas (KSB) based on their performance in the EPA. These scores will then determine what grade the apprentice achieves. They can either get a pass, merit or distinction on their apprenticeship. What is also worth noting is that they cannot achieve their apprenticeship without passing the EPA. What does the End-Point Assessment involve? Each apprenticeship’s End-Point Assessment is different. However, all EPAs must involve at least 2 different assessment methods. But you will more than likely find that most EPAs will typically involve 3 assessment methods. Every apprenticeship standard has an accompanying assessment plan. You can find out what EPAs in your area of expertise involve by finding the appropriate assessment plans online. What’s the Difference Between EPA Assessment Plans and Regular Assessment Plans? In the context of apprenticeships, an ‘Assessment Plan’ details absolutely everything that anyone could need to know about the EPA. The most important thing that you need to know about EPA Assessment Plans is that they are predefined documents. So, unlike regular assessment plans, the assessor isn’t required to create it. The methods are specified within the End-Point Assessment will be the ones that are most relevant to the job. A regular assessment plan on the other hand, is a document that is created by an NVQ assessor or trainer and given to to the learner. This plan will detail what assessments the assessor will be doing on the learner and (if they are assessing them on an NVQ) what criteria, from the learner’s qualification, those assessments should meet. There should be quite a few of these assessment plans created throughout the duration of the apprenticeship. Whereas, there is only one assessment plan for the EPA. Notice the difference between the common assessment methods used on regular assessment plans compared to those that feature in EPA assessment plans. If you are reading this and you are still unsure about the difference between an NVQ Assessor and an End-Point Assessor we would advise having a read of that blog. It should help to clear up any confusion. What Is An End-Point Assessment Organisation? An End-Point Assessment Organisation (EPAO) is an organisation that has been approved by the ESFA (Education and Skills Funding Agency) to deliver the EPA of apprentices completing the new apprenticeship standards. The EPA must be delivered by an independent EPA organisation. They cannot have any affiliation whatsoever to the employer or the training provider involved in the apprenticeship. Once they’re approved, they can be added to the register of apprentice assessment organisations. Then, when an employer takes on an apprentice, they can select the EPA organisation from the register. Once they’ve done this, they can confirm this selection with their training provider. How Much Does The End-Point Assessment Cost? On average, an EPA costs between 10 and 20% of the overall cost of the apprenticeship delivery. Just to clarify this, it cannot be any more than 20%. However, this price may vary according to the requirements set out in the standards – such as assessment tools, methods, and the estimated completion time. For non-levy payers, the employer will pay 1/3 of the EPA costs whilst the ESFA pays 2/3. As for levy paying employers, the EPA will be funded by their levy contributions. Most EPAOs charge for the EPA towards the end of the apprenticeship journey. This payment is handled by the training provider. ← What Assessment Methods Can I Use With My Learners?